Raymond J. Rodgers, 93, of Greenwood, passed away Thursday, March 28, 2019. He was born to Samuel and Dorothy (Pratt) Rodgers on October 22, 1925 in Indianapolis. Ray served in the United States Army Air Corp from November 1943 until November 1945. Ray spent his life serving his country in other ways than just through the Air Corp. 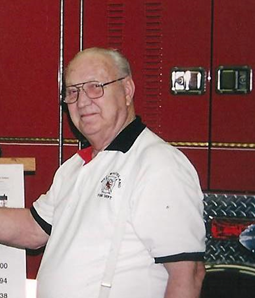 He worked for the New Whiteland Fire Department for 54 years, serving as a chief during that time. Ray was also a fire marshal for the New Whiteland Fire Department. He also worked for the New Whiteland Police Department for 10 years. He built ambulances and sold fire equipment. Ray was a police officer for Indianapolis International Airport Authority for 20 years. He loved woodworking, he made wood signs for many people. Ray was the owner and operator of Identograph, a plastic mold signs company. After his years of service to his community, Ray enjoyed travelling during his retirement. Ray is survived by his two daughters, Rebecca Byers of Pawleys Island, South Carolina and Deborah (Mike) Patterson of Indianapolis; his five grandchildren, Brian W. Hedrick, Christopher J. Hedrick, Dustin E. Stockdale, Chelsea L. Patterson, and Benjamin M. Patterson; and 10 great-grandchildren. Ray was preceded in death by his parents, Samuel and Dorothy (Pratt) Rodgers and his brother, Charlie Rodgers. A visitation will be Saturday, April 6th from 10 a.m. to 12 p.m. with a service immediately following at Jessen Funeral Home, 729 N. U.S. Hwy 31, Whiteland, IN 46184. Private burial services to be held.